The educational goal of this Department is to prepare students to become engineers, teaching them the theory of constructing and managing infrastructure, which they can then apply to real world situations. Our mission is to help students to develop a wide field of vision and an open mindset that would help them contribute to society’s safety, comfort and quality of life. The construction engineering Master’s degree, the forerunner of the civil engineering major, was established in April, 1951, with the Doctoral degree being established in March, 1953. 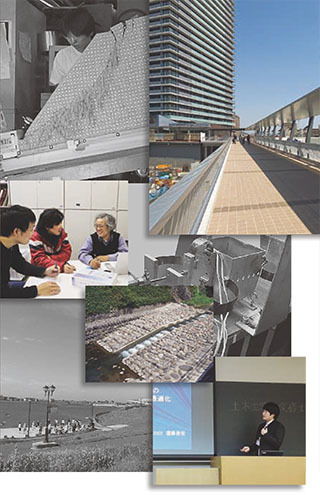 The first graduates received master’s degrees in 1954 and have worked for research institutes, national and prefectural governments, various public corporations, electric power companies, and as construction companies, and as consultants. The demand for graduates has been increasing in recent years due to society’s growth and change. Courses in this program are offered in six groups: Structural Mechanics, Geotechnical Engineering, City Planning and Surveying, Hydraulics and Coastal Engineering, Environmental Engineering, and Construction Materials. Courses are taught by both full-time faculty and associate instructors. To receive their master’s or doctoral degrees, students must complete research that is conducted at facilities of the University and of outside organizations under the supervision of faculty members.